Montygog's Art-O-Rama! : Hey, everybody, I wanna Seymour Butz! Hey, everybody, I wanna Seymour Butz! 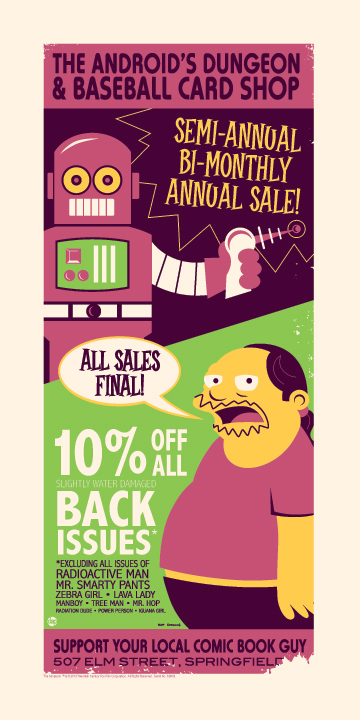 Here's a look at two new prints in the officialy licensed Simpsons series being sold through Acme Archives Dark Ink. 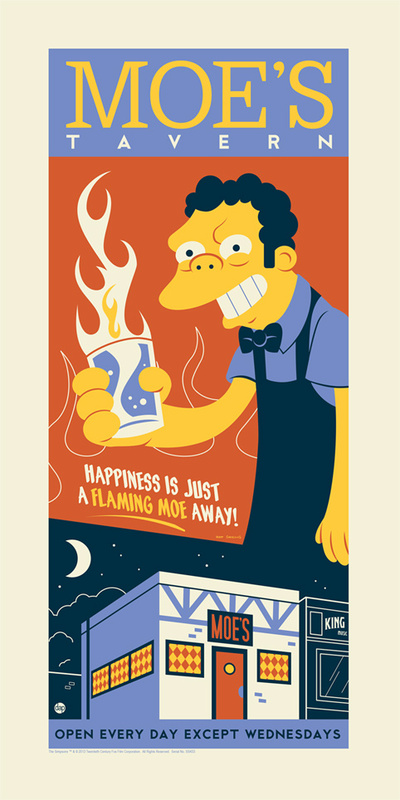 First up is Springfield's favorite bartender, Moe Szyslak, available starting Tues. July 9th around 10am PDT. 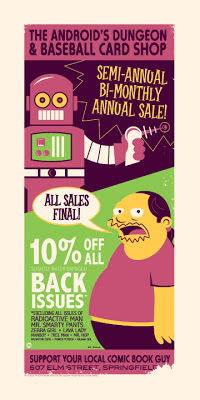 After that, they will be releasing at this year's 2013 San Diego Comicon an exclusive print of Jeff Albertson AKA Comic Book Guy, preorder is available through Dark Ink but you must be able to pick it up at SDCC. The Simpsons TM &© Twentieth Century Fox Corporation. All Rights Reserved. Great job on these! Love the style and the colors that you used. I just ordered the Moe's Tavern screenprint and hopefully I'll be able to get that comic-con exclusive on the non-attendee ordering. First purchase for me at Acme Archives. I noticed that you listed Twilight Zone and Hanna Barbera as some of your inspirations. I'd be interested to see your interpretations of those in pieces like these.